"Burj Khalifah" redirects here. For other uses, see Burj Khalifah (disambiguation). Burj Khalifa (Arabic: برج خليفة‎, "Khalifa Tower") is a very tall skyscraper in Dubai, United Arab Emirates and is the tallest building ever built, at 828m (2,717ft). Before the building opened, it was called Burj Dubai. The building is 162 stories high. Construction of the tower was started in 2004. The building was officially opened on 4 January 2010. It is the tallest structure made by humans in the world. The building is more than 300 metres (980 ft) taller than Taipei 101. Taipei 101 was the tallest building until 2010 before Burj Khalifa was built. Adrian Smith designed the tower. He worked with Skidmore, Owings and Merrill (SOM) until 2006. It was built by Samsung Engineering & Construction, Besix, and Arabtec. The tower cost US $1.5 billion to build. The building is part of a 2 km building project on Sheikh Zayed Road, Downtown Burj Khalifa. It is near Dubai's main business district. 1.3 Workers' disputes and strikes. Burj Khalifa compared to some other tall structures. The main contractor was Samsung C&T of South Korea. They also built the Taipei 101 and Petronas Twin Towers. Other contractors who helped with the building included Belgian group Besix and Arabtec from the UAE. The Turner Construction Company was chosen as the construction project manager. The design architect, Adrian Smith, did not like the first design of the upper part of the building. He added 27 new floors and an aluminium spire to the top of the plans. The design of Burj Khalifa based on those used in Islamic architecture. Burj Khalifa has been said to have had several other planned height increases since it was first built. This has not been proven to be true yet. The TV/radio communications mast was added to the tower's plans in 2007. This was after building work had begun in 2006. There are pressurized, air-conditioned refuge floors about every 35 floors. These were put into the tower in case of an emergency or fire. The unusual design and engineering problems of building Burj Khalifa have been shown in many television documentaries. These include the Big, Bigger, Biggest series on the National Geographic and Five channels, and the Mega Builders series on the Discovery Channel. The most important building materiel of Burj Khalifa is reinforced concrete. A special concrete was needed because of the high pressures of the building's weight and the hot local climate of Persian Gulf temperatures that can reach 50 °C (122 °F). Any major cracks could have caused a large amount of damage to the building. The foundation of the building is 15 metres (49 ft) deep. It was built with 192 columns being put into the ground. Each column was 1.5m in diameter and 43m long. 55,000 tonnes of steel rebar was used in the construction of the tower. It took 22 million man-hours to build. A high density, low permeability concrete was used in the foundations of Burj Khalifa. A cathodic protection system is used to lessen any bad effects from corrosive chemicals in local ground water. 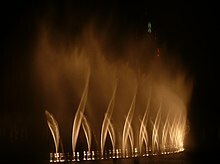 The Dubai Fountain performing to the song "Bassbor Al Fourgakom"
A fountain system was built outside the tower. It was designed by WET Design of California. They built and planned out the fountains at the Bellagio Hotel Lake in Las Vegas. The fountain cost Dh800 million (US$217 million). It is lit by 6,600 lights and 50 coloured projectors. The fountain is 275 ft long. It shoots water 150 ft into the air to the sounds of classical and modern Arabic and world music. On 26 October 2008, the fountain was named the Dubai Fountain. The Burj Khalifa being made, in 2008. Emaar Properties said on 9 June 2008 that construction of Burj Khalifa was slowed because of changes to finishes. An Emaar official said that the luxury finishes that were decided on in 2004, when the tower was first planned, were being being replaced by better finishes. The design of the apartments were also made better. This was done to make them both look better and work better. There were problems with the marble decorations, flooring, the top floors' sanitation system, broken glasswork and a poorly done wall mural of the Sultan of Oman. A new ending date of 2 December, 2009, was then given. Burj Khalifa opened on 4 January 2010. Burj Khalifa was built mainly by people from South Asia. Press reports said in 2006 that skilled carpenters at the site earned UK£4.34 a day, and labourers earned UK£2.84. According to a BBC investigation and a Human Rights Watch report, the workers lived in very bad conditions. Often they were not paid for the work. Their passports were taken by their employers. It was said that they were working in dangerous conditions that caused high number of deaths and injuries. Companies not paying workers has been reported to the authorities several times. On 21 March 2006, about 2,500 workers protested. They were mad about buses that were delayed for the end of their shifts. They damaged cars, offices, computers, and construction equipment. A Dubai Interior Ministry official said they caused almost UK£500,000 in damage. Most of the workers who were part of the riot returned the following day but would not work. A cartoon animation of construction process. Highest outdoor observation deck in the world (124th floor), at about 440 m (1,440 ft). World's highest installation of an aluminum and glass façade, at a height of 512 m (1,680 ft). ↑ "Architect Magazine: Adrian Smith Leaves SOM, Longtime Skidmore partner bucks retirement to start new firm". ↑ "What to see". Dubai Travel Desk. Retrieved 23 March 2009. ↑ 11.0 11.1 "Burj Dubai, Dubai, at Emporis.com". Emporis. Retrieved 1 March 2007. ↑ "Emaar brings world-class water, light and music spectacle to Burj Dubai Lake". Emaar Properties. 9 June 2008. Retrieved 13 June 2008. ↑ 16.0 16.1 16.2 16.3 16.4 Whitaker, Brian (23 March 2006). "Riot by migrant workers halts construction of Dubai skyscraper". The Guardian. Retrieved 25 March 2006. ↑ 20.0 20.1 "Some interesting facts on the Burj Dubai". The Tallest Buildings in the World. 19 August 2008. Retrieved 1 August 2009. ↑ 21.0 21.1 "Putzmeister – Burj Dubai". Putzmeister. Retrieved 23 March 2009. ↑ "1994 – World record: 532 m high - rise concrete conveying at the power station "Riva del Garda", Italy". Putzmeister. Retrieved 11 April 2009. ↑ "'At The Top' - Burj Dubai's Observation Deck". BurjDubai.com. Retrieved 6 January 2010. This page was last changed on 17 March 2019, at 10:45.